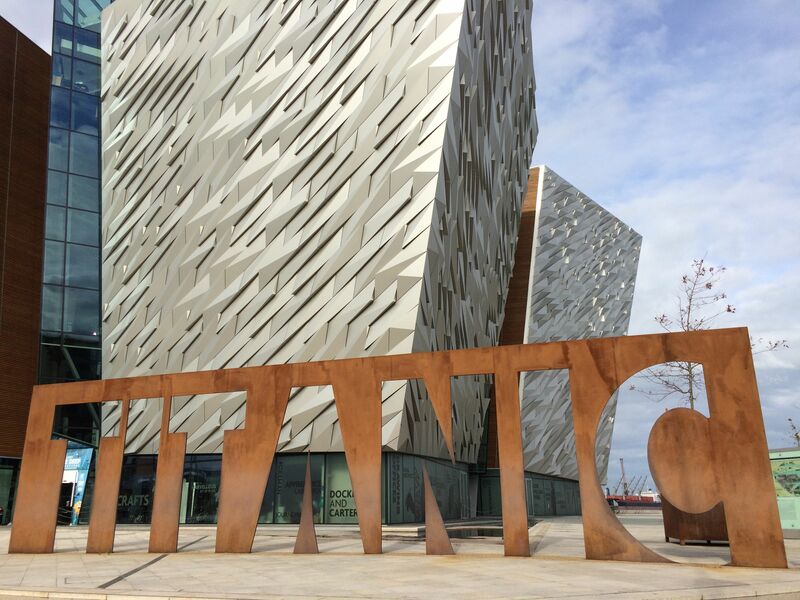 Northern Ireland – Belfast – City, ships and craftsmanship. We arrived in a sunny Belfast late Saturday afternoon, leaving London in the rain. We explored the city for a couple of hours before dusk settled. The city centre has a mix of Victorian, Edwardian and modern buildings. 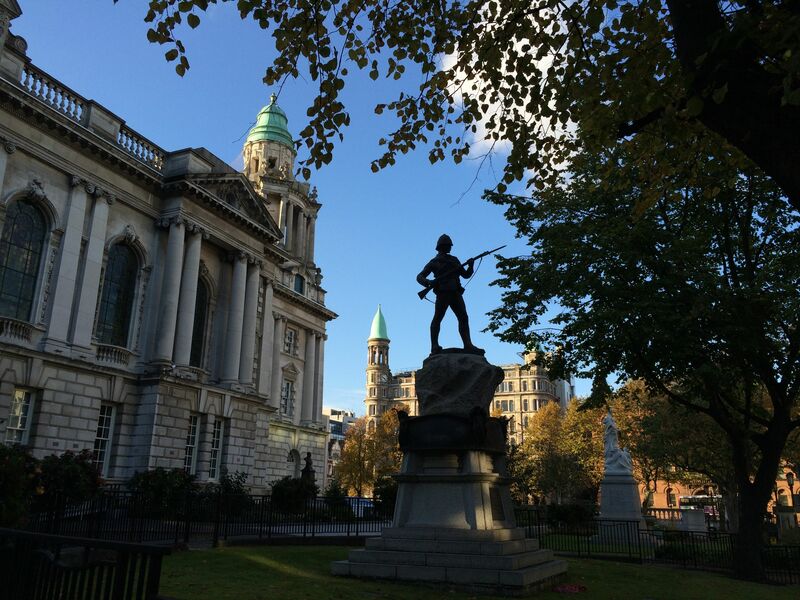 A grand City Hall is the centre point of Donegall Square, surrounded by wide streets and avenues. 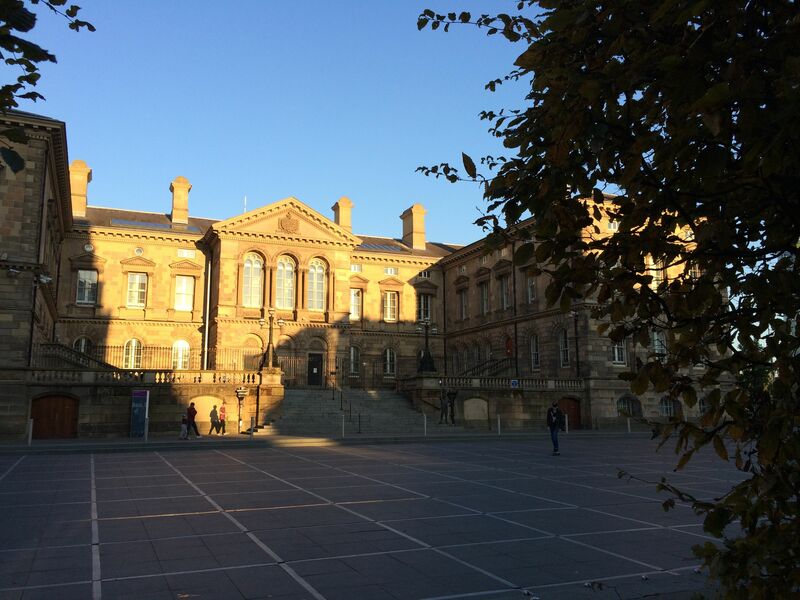 The Assembly Buildings, Queen’s University, Opera House and Customs House are other impressive buildings. There are clock towers and the expected churches and cathedrals and the River Lagan runs through the city. Monday morning we walked across the city, over the weir footbridge, past the Odyssey and marina, to the Titanic Experience. 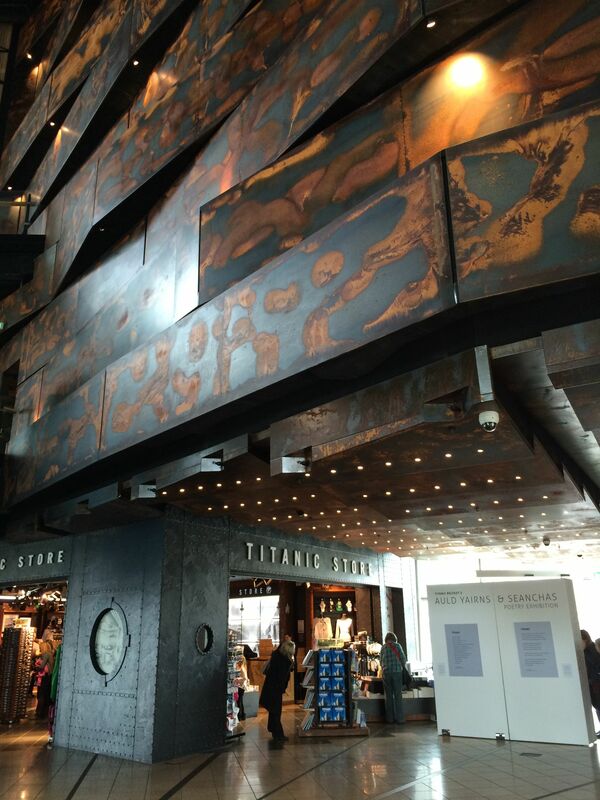 It’s in a magnificent building, opened in 2012 in time for the Titanic centenary. The exhibition or experience is brilliant, with enlightening audio guides and interactive displays. It starts by setting the social scene of the times, the industry, life on the city streets, emigration. It introduces the ship yards, Harland and Wolff. It takes a ride through the ship yard as Titanic was being built, the manual and automated jobs, the giant gantries specifically built, the purpose built dry dock. There is an interesting model of Titanic, one side as a steel hull carcass, as it left the ship yard, the other side once it was fitted out, with completed decks, rooms, propellers. There is a creative three sided visual tour up through the decks. A physical display of a first class cabin compared with second class and basic third class accommodation. It shows samples of wood panelling, carpets, fabrics and emphasises that the majority of third class passengers would not have been used to the warmth and running water on the ship. A spacious area gave the impression of the promenade deck before the exhibition moved to the sinking of the ship. We followed specific passengers and their fate, as the iceberg hit, during the night of the sinking, the rescue to the aftermath and inquiry. Original photos and personal accounts added to the authenticity. The final section covers the discovery and exploration of the wreck. The experience is well worth a visit. Outside, the actual size of the ship and it’s sister ship, Olympic, are laid out, side by side, with representation of the percentages who survived and were lost for each passenger class and for the crew. There is a memorial in the city with all the names listed. A separate part of the Titanic trail is the dry dock and pump station. Again here you feel the immense size of the ship, the length and height. We’d noticed a postcard of an interesting looking pub, so we took a taxi back into the city. The cabbie was very chatty, asking where we were from. We said we were having a great time and found everyone to be very friendly. The cabbie commented that locals are friendly, just not to each other. Oh. 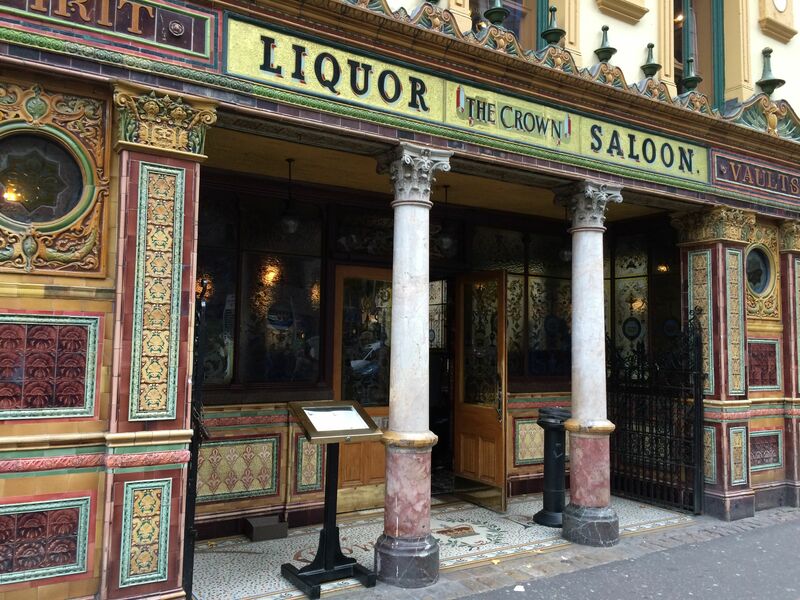 The Crown Liquor Saloon is a unique Victorian pub. Italian craftsmen were in Belfast building churches, also moonlighting, working on the pub after hours. Hence, the stained glass windows, decorative woodwork, ornate ceiling and mosaic floor. 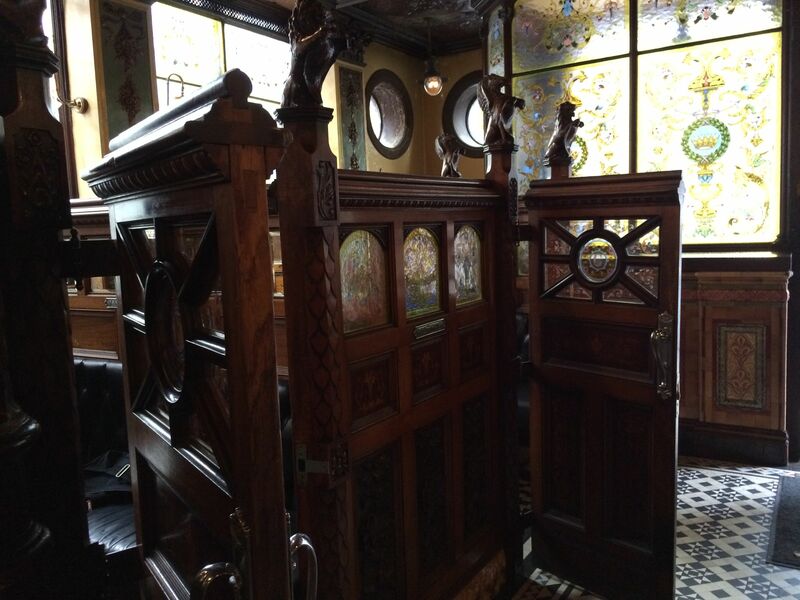 The pub contains ten different sized nooks or snugs, secluded seating areas with doors labelled A to J. These are along the lines of confessional boxes. The bar has been owned by The National Trust since 1978, who worked on its restoration. The bar is opposite the Europa Hotel – the most bombed hotel in Europe. It has a great atmosphere, a mix of locals, workers and tourists taking photos. It was a fun place to end our day. As a member of the National Trust we had free entry to the rope bridge and to the Giant’s Causeway. Unfortunately, there were no freebies for NT members at The Crown.